Dating back to the 10th century, Sóller is a thriving town whose narrow winding streets are home to a cluster of colonial mansions leading to the bustling Plaça de la Constitució. Just a few kilometres away, Fornalutx is located deep in a spectacular valley in the heart of the Tramuntana Mountains. Widely regarded as the ‘prettiest village in Mallorca’, its distinctive architecture and enchanting vistas are popular with walkers, hikers, painters and photographers. To complete the picture of your luxury holiday in Fornalutx and Sóller, we are happy to offer a sumptuous handpicked villa to help you make the most of this timeless corner of Mallorca. The marriage of exquisite hamlets, towns and villages, green valleys and the majestic gravitas of the Serra de Tramuntana make the north-west Mallorca’s most diverse landscape. The 90km rugged mountain range, a UNESCO World Heritage Site, spires above olive groves and pine forests and offers a wealth of paths, trails and roads to drive, cycle, hike or wander through. There’s also a number of small, perfectly formed beaches and sheltered coves less than half an hour from Fornalutx that come with views to inspire any artist. Agriculture lies at the heart of the region’s history – an interweaving of ancient Muslim and Christian cultures. The result is a landscape shaped by terraces, dry-stone walls, canals and water storage basins to support the local orchards, vegetable gardens and olive groves, with many abandoned farmhouses in the hills. During the 14th and 15th-centuries, olives were the main source of income and there were around 60 mills in the Sóller area alone. You can visit the huge olive presses (tafonas), including one in C’an Det that’s still in use. The region also has a centuries-old tradition of cultivating citrus fruit, in particular, the Canoneta orange, thought to have originated here and there’s also Sóller’s famous prawn industry – a seasonal treat worth hunting down on seafood menus. In one of Spain’s prettiest villages, tranquil Fornalutx, is a gathering of 18th-century stone houses in the heart of the mountains. You’ll find banks, shops and a post office and there are some exceptionally good restaurants off the tiny main square. But best of all, as you stroll along the cobbled lanes, you’ll catch the scent of the orange and lemon groves nearby. From the village you can head off along trails into the Tramuntana Mountains or explore the Golden Valley, aptly named for its fertile abundance of unctuous olive oil and citrus fruits bursting with sunshine. There’s a flavour of France in the winding streets of Sóller. Just a few kilometres from Fornalutx, this thriving, ancient town has a bohemian, even flamboyant air. There’s a gathering of charmingly faded colonial mansions and, presided over by the baroque Church of Sant Bartomeu, the Plaça de la Constitucio bustles with life. Colourful cafés, restaurants and bars spill out onto wide, tree-lined pavements, while trams trundle by, heading out to chic Puerto Sóller. And linguists will notice that, in some quarters, conversation is in French with a Mallorquin twist, making it audibly as well as visibly different to the rest of the island. From shingle to almost pure white sand, a stay around Sóller and Fornalutx gives you easy access to a selection of sun-drenched beaches, within the region itself, but also in the south of the island, beyond Palma, and in the north, around Pollença: coastlines blessed with spectacular scenery and perfectly clear waters. For view seekers heading north, if you’re not in a tearing hurry to lay down your beach towel, opt out of the quicker motorway route and, instead, take the scenic Sóller-Pollença road with its dramatic mountainscapes. Sóller has a few local specialities, including the Sóller Bay prawns, on menus in June and July and served in garlic oil – and look out for the town’s robust home-grown snails! Those with a sweet tooth should try the famous cocas de patata on offer at the Real Cartuja Monastery and the various festivals in Valldemossa. There’s also a fine selection of pastry shops and the local ice cream is always a pleasure. Otherwise, the region offers a typically Mallorcan melting pot of culinary traditions, with sweet and spicy ingredients added by the Moors and style, sophistication and New World ingredients from the Catalonians in the form of pimentón (smoky paprika) and tomatoes. The variety and quality of charcuterie is also superb, with Ibérico and Serrano ham topping the ever-popular pa amb oli and enjoyed as tapas all over the island. Local wine production is flourishing, particularly in the Binissalem region and around Inca, whilst the Ca’n Vidalet vineyard near Pollença creates some award-winning vintages. Beer and tapas make the perfect partners, but after a long, lazy meal, sip a potent anise-based Hierbas. And if you want a soft drink, Sóller’s numerous orange groves are a source of freshly squeezed juice, full of flavour. Puerto Sóller is ideal for dining on fresh seafood along the promenade with a sea view and people watching and, as you’d expect in most Spanish towns and villages, there’s also more great food and snacks to be enjoyed in the bars and restaurants around the main square. This is certainly the case in Sóller, where the pedestrianised plaza major, overlooked by the church, offers a safe space for children to play while parents enjoy a drink or two. If you’re thinking of eating in upmarket Deià, book ahead – tables at the elegant (and elegantly priced) restaurants are in demand. Alternatively, for traditional restaurants in a stunning rural setting, make your way to Fornalutx, where there are plenty of tapas bars. A bay with two beaches: the main beach, a small sand-shingle strip with a promenade lined with cafés, shops and restaurants, and sandy Platja d’en Repic, a five-minute walk away. Just a 15-minute drive from Fornalutx, past Sóller, or catch the vintage tram from Sóller. Platja d’en Repic is the nicer of the two, with its own restaurants, although it shelves steeply into the sea. Pedalos are available at the main beach. From this unspoilt half-moon of shingle, overlooked by Puig Major, the water is exceptionally clear and, due to its remote location, there’s plenty of space even in high season. Accessible by boat from Puerto Sóller or an hour by car from Sóller, along the Lluc mountain road and on the left just before Sa Calobra. Great for snorkelling, with a restaurant just a five-minute walk away. Although there are no sunbeds or parasols, the dramatic mountain scenery makes up for it. There’s one beach near the car park and restaurants, but through a tunnel cut into the mountain you’ll find another; a small, unspoilt sand and shingle cove with clear waters. Accessible by boat from Puerto Sóller or down the Sa Calobra road, off the Pollença-Sóller road has been featured in car ads and on Top Gear. A classical concert is held here once a year, usually around the first Sunday in July, and it draws the crowds – the echo and natural acoustics making it a unique experience. A small, shingly, but very beautiful beach that shelves sharply into clear waters. It’s popular with the sailing crowd who come for the two excellent beach restaurants in spectacular surroundings. A 25-minute drive from Fornalutx. Parking is limited near the beach and fees apply – you might prefer to leave your car in Deià and walk down the steep path. There are no sunbeds or parasols and, although it’s a good spot for snorkelling, the beach isn’t particularly child friendly. A fishing village resort with four beaches: the first Cala Barques, the largest Cala Molins, the smallest, Cala Clara, and Cala Carbo at the far end – the only one with pebbles not sand. It’s an hour’s stroll across country from Puerto Pollença and about an hour to drive direct from Sóller. There are plenty of facilities and restaurants nearby and all the beaches share the same turquoise waters and backdrop of dramatic cliffs. It’s a popular spot for divers too. It’s the spectacular mountain drive down that makes this small stony beach worth a visit – plus the popular seafood restaurant, great swimming and impressive cliff views you find when you get there. The beach is 6km down from Valldemossa along a narrow road with numerous hairpin bends. There are few other facilities, but if you’re looking for peace and quiet, that’s a bonus. From its vantage point above Sóller, pretty Fornalutx offers stunning mountain views from nearly every angle and yet this gathering of narrow streets is lovely in its own right. Go in the morning before the crowds and stay for lunch in the main square. You may visit for a wander through the elegant architecture or galleries celebrating the work of Picasso and Miró, but it’s Sóller’s main square, with its cafés and impressive 18th-century church, that invites you to linger, over a pastry or a selection of tasty tapas. The composer spent just a single winter here, but this atmospheric town, 30 minutes from Sóller, has claimed him as its own. The tree-lined, cobbled lanes are crowned by the 14th-century Real Cartuja de Valldemossa Monastery, with its collection of Chopin’s pianos. Described as one of the greatest drives in the world, and featured in a number of car commercials, this serpentine road winds its way through narrow gorges and 26 hairpin bends. Turn off the Ma-10 between Fornalutx and Pollença, towards the Port de Sa Calobra. Signposted trails start in Fornalutx and draw beginners and well-seasoned walkers alike into this mountainous landscape, rewarding them magnificently for their efforts. And to add to the adventure, trips to the highest peaks include a night in a shepherd’s hut. Literary pilgrims flock to the beautiful village of Deià, a cluster of green-shuttered stone houses, charming cobbled streets, agricultural terraces and first-rate restaurants. This idyllic spot, perfect for doing very little, was home to poet and novelist Robert Graves, who’s buried in the churchyard. Follow the mountain road from Sóller to Pollença and, about 4km from Fornalutx, you’ll find the Mirador des Barques lookout point and café-bar. Try the tasty almond cake with a coffee and exceptional views across to Puerto Sóller. Then continue on to Pollença. From an historic cathedral to fantastic shopping in the Passeig d’es Born and Avenida Jaime III, the island’s capital has something for everyone, including an Old Town with tapas bars to complete your day. Drive there in 30 minutes from Sóller or take the Little Train. How are you? ¿Cómo estás? Fine thanks. And you? Bien gracias. ¿Y usted? Do you speak English? ¿Habla inglés? Can you bring me the bill please? Me trae la cuenta por favor? At Easter (Semana Santa) there are events throughout the island, including daily processions in Palma the week leading up to Good Friday and a ceremony in Pollença’s Old Town involving a statue of Christ being carried down the Calvary Steps and into the main church. Les Valentes Dones. Several days of celebrations in Sόller to honour the brave Casesnoves sisters who helped save their town from pirates. the region’s biggest event, Fira and Firo: Festa de Nostra Senyora de la Victoria, features re-enactments of the 1561 battle between the Moors and Christians in Puerto Sóller. Corpus Christi, celebrated in Pollença with processions and the Dance of the Eagles performed in the main square. Santa Catalina Thomas in Valldemossa is an opportunity for lively feasting and processions of bulls drawing carts through the town. Patrona de Pollença daily festivities bring in the crowds for concerts, children’s entertainment, sporting demonstrations, markets, battle re-enactments and all-night revelry. Assumption of the Virgin is an important religious festival and a national holiday celebrated throughout Spain. Shops and businesses close. 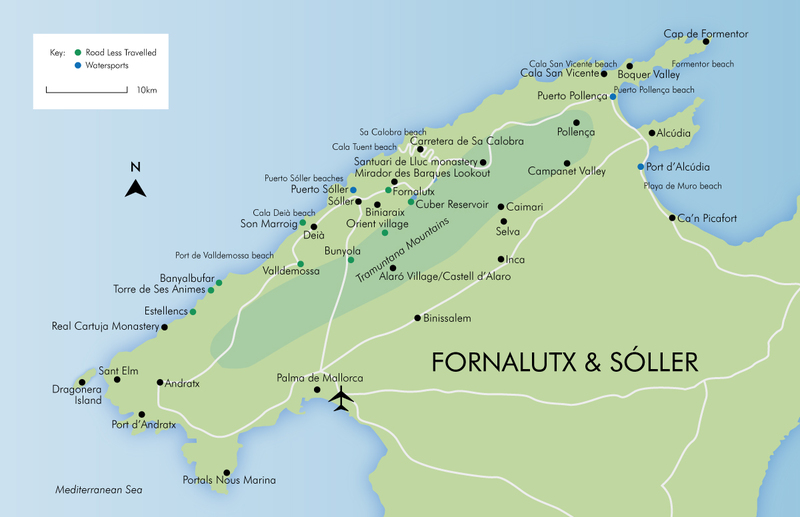 The Fornalutx Festival includes an arts and crafts market, children’s games and an evening closing celebration with fireworks. Festa des Vermar in Binissalem is a lively grape-harvest festival with tastings, concerts and processions. Off the road between Estellencs and Banyalbufar, with access via a steep stone staircase, the Torre de Ses Animes was built in 1579 as a first line of defence against pirates and overlooks a breathtaking landscape. It’s an idyllic spot to watch the sunset and if you can time your visit with a full moon, you’re in for an even more atmospheric experience. There’s a path across the mountains built by the Austrian Archduke Louis Salvador, a nature lover and travel writer, who was passionate about Mallorca. (His former home, Son Marroig near Deià, is now a museum). Starting in Valldemossa, the route is for experienced walkers, although you can hire a guide, and it takes you up to the Ses Puntes viewpoint. Fornalutx is full of narrow canaletas – irrigation channels that are the remains of an ingenious old water system built into the mountains, and in spring, the water tumbling down them is quite impressive. Starting near the village, there’s a 45-minute walking trail called the Eight Waterfall Walk, which follows the river and has plenty of water features in its own right. On the slopes of the Tramuntana Mountains is pretty Orient, one of Mallorca’s most remote villages. It’s believed to have just 33 inhabitants and will take you back to the 18th century with its architecture. Drive the very scenic PM-210 from Bunyola, 11km from Sóller (not for the faint hearted!) or take the Sóller-Palma train, which stops at Bunyola, and walk the 6km through the valley. Along the mountain road from Sóller to Pollença (Ma10), you’ll find the Cuber Reservoir which offers walks with far more than a breath of fresh mountain air. The area is rich in plant and animal life and a prime spot for birds of prey, including the black vulture, booted eagle, red kite and peregrine falcon.